I sweated a lot in a Bikram yoga class - Go Fit Girl! | Go Fit Girl! Let me say that I realize this post may cause dislike, disagreement, possibly anger … But this is my opinion and my feelings on hot yoga. And you are allowed to disagree. I don’t believe Bikram yoga (hot yoga) is real yoga. After experiencing it I will say it is some form of exercise? … yoga poses where you are in a super hot room and sweat like crazy. If you like doing it I am not saying you shouldn’t do it. I’m just saying … it ain’t real yoga. Over the past year or so I believe I have become a self-proclaimed yoga snob. In terms of the type of yoga classes I take, the teachers I study under and even the way I am trying to develop my skills as a teacher. When I first started taking yoga in 2007 it was solely for exercise. And there is nothing wrong with that. About four years ago I started taking yoga at a yoga studio. I found different styles of yoga and different teachers I enjoyed studying under. And I found styles of yoga and teachers I didn’t enjoy. My normal practice consisted of Hatha Yoga and Vinyasa Yoga. The original intention of asana practice (just one of eight limbs [parts] of the yoga practice) was to get your body and mind ready for meditation. So how does hot yoga do that? Friends have told me they feel like they are going to pass out, throw up and/or die during a hot yoga class. I had one friend who actually passed out. I understand that a Bikram class consists of the same 26 poses every class and there is a script that the teacher must follow. According to an article titled, What is the Bikram script?, Bikram yoga teachers learn the Bikram script word for word and are taught never to deviate from it. Last week I took a class to really experience a hot yoga, Bikram class. When I walked in the room to set down my mat I thought I was gonna die. It was so hot and humid in the room. Bikram classrooms are heated to 105 degrees. I wasn’t sure if I could make it through the whole 90-minute class. But I stayed in the room the whole time taking breaks when I needed. According to the Bikram website, Bikram calls the heated studios “Torture Chambers.” My comment to this is that yoga is not about torture or pain. I have taken heated classes before (about 80-85 degrees). I understand the need to loosen muscles and detox. But I feel like 105 is rather extreme. I am not clear on what the point is to have the classroom that hot. Throughout the class I had some concerns about the instructions for alignment. Such as the teacher telling us to lock our knees in certain standing poses. As someone who hyperextends that is exactly what I am trying to not do. In some of the reclined poses we were instructed to have our neck flat on the floor. Eeek! You can really hurt your neck that way. Keeping your natural curve seems so much safer to me. In certain poses we were instructed to push or pull. The way I have studied and practiced yoga (and teach it) is that you find your edge and maybe take a step back. You never want to push or pull your body into a pose that could be unsafe for your body. Because of the strict script there really aren’t any modifications. There were no props. The teacher had a thick accent so it was difficult for me to understand her at times. And some of the names of the poses were different than what I am used to. 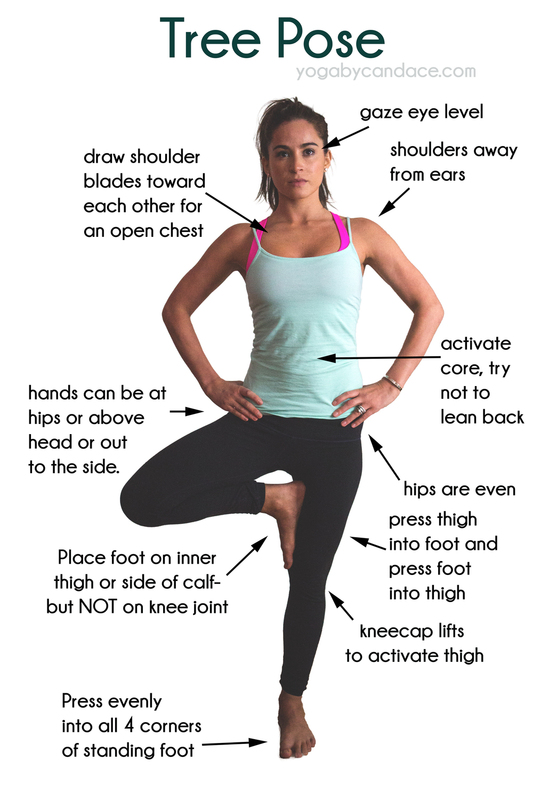 Bikram tree is different than the tree (Vrksasana) I am familiar with. Half Moon is one pose in Bikram and another in every other yoga class I have been in. I was surprised to see that the studio had a mirror and we were encouraged to utilize it. Yoga isn’t about the perfect pose. It is about how it feels in your body at that moment. A few months ago I found a blog post in which the author gave her own opinions on hot yoga. I agree with a lot of what she has to say. And as a fellow yoga teacher I respect her opinion. I like attending yoga classes with some sort of theme or focus (which is how I have been trying to teach my classes lately). Besides the awful heat I think I would get bored doing the same 26 poses every single time. I need variety. And to hear the teacher say the same thing every single time … I need some jokes and humor thrown in there as well and some personality. If you like practicing hot yoga, go for it. I would just ask that you be aware of alignment issues and what your edge really is. Make sure you take care of yourself and honor your body. If something hurts don’t do it. There are lots of types of yoga and lots of types of teachers for a reason. I was not a fan of hot yoga and will likely not be going back.